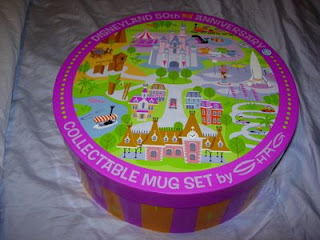 This is the outside box of the Disneyland 50th Anniversary Collectable Mug Set by Shag. This box is art all by itself. I will show you the mugs inside the box on another posting. Suffice it to say, Disneyland had some really cool stuff for sale for its 50th Anniversary. Shag created a lot of the designs for the merchandise- he's really super-talented!